The Amsterdam Evening Recorder sports staff used to refer to him as Freddie Robbins. 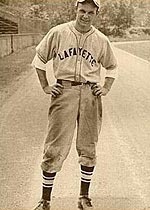 He was a left-handed pitcher from Easton, PA who joined the Amsterdam Rugmaker Staff in 1950 at the age of 24, which back then was sort of old to be reaching the C-Level of the Minor Leagues. But Robbins had been pretty busy doing other things. You can read the rest of my story about this former Amsterdam Rugmaker in my new book “A Year’s Worth of Amsterdam Birthdays.” To order your copy, click here.